Program Terms and Conditions apply. 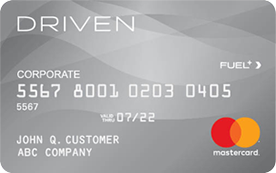 Visit www.drivencardmc.com/terms for details. Fees may apply in some cases, such as for optional services, late payments and/or credit risk. The Driven Mastercard® is issued by Regions Bank, pursuant to a license by Mastercard® International Incorporated. Mastercard® and the Mastercard® brand mark are registered trademarks of Mastercard® International Incorporated.